This week's Market is our 14th; after it's over, we'll be just past the halfway point of the season. Halfway already?? This here entry will be short due to the fact I'll be out visiting Moore Family Farm in Watseka tomorrow (the same Moore Family Farm that produced the above cabbage and lettuce) during my usual posting time and so don't have much time to talk about this weekend. 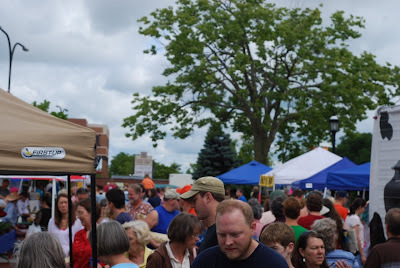 Just as well - this weekend we get a bit of a breather, if you call a sold-out Market loaded with fresh produce, several new artisans, crazy amounts of prepared food, and the Urbana Free Library a breather. Also, many, many thanks to Common Ground Food Co-op for the use of their kitchen. Without you, we'd have been nothing! The next Sprouts event will be August 22. It's going to be all about... corn. More info soon! That's all I have for now. See you at the Market! I just realized that this weekend's Market is already our Lucky Thirteenth. Where's the summer gone? Jeez. Last weekend was breathtakingly awesome - the weather cooperated, the sweet corn trucks looked like a Macy's underwear sale, and the crowd was phenomenal. 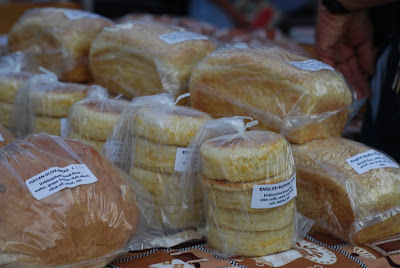 These and other photos can be viewed at the Market's Flickr page. They're usually posted by Monday or Tuesday following the Saturday Market. OK, enough about last week - it's so... last week. How about this week? The produce situation at the Market gets a big thumbs-up. 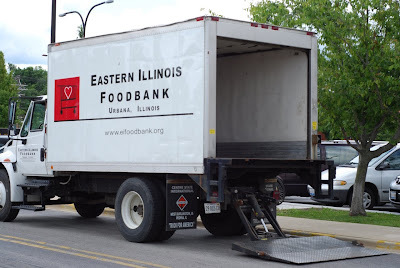 Everything you saw last week will be there this week: southern IL peaches, sweet corn, berries, eggplant, just about everything under the sun. It might be a couple more weeks before any melons are in evidence, so if they're your thing, please be patient - the cooler weather isn't helping melons along. 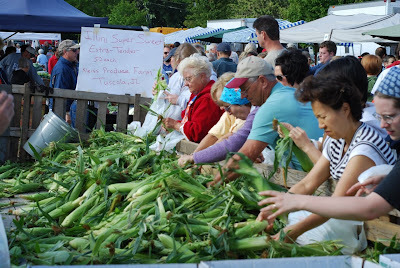 If you're into corn, please remember two things: a) there's more corn than what you see when you walk in, so please stop by the City tent if Bob Kleiss' truck in Row One is spent - we'll tell you where there's more corn and b) that said, arrive early - before 10 AM for sure! - to get your pick. People are elbow to elbow at those trucks and, I can only assume, are buying dozens of ears to put on the grill. Our second Sprouts session is happening this Saturday. This month's theme is "color families" - what can a orange vegetable or a yellow fruit do for you? The event goes from 9 AM-11 AM and is a self-guided nutrition/farm trivia tour through the Market that includes tasting of some fruits and vegetables. Kids and their carergivers can stop and sign in at any Sprouts table (look for the chick symbol!) or at the Sprouts main tent at the NW entrance to the Market (you only need to sign in once). This event is free and is open to kids of all ages, but is geared toward 4-10 year-olds. All participating kids will receive a Sprouts certificate, and Sprouts shirts will also be for sale. We'll have another event in August (all about corn) and the final Sprouts event will be in late October (healthy trick-or treat). Hope you can make it! - The much asked-about new Market t-shirt is in its final stages of design and we should have them ready very soon. Keep your eyes peeled! - Suitable-for-framing 2009 Market posters should be for sale at the City tent this weekend - they're limited to 100, so each is numbered. They'll be just two bucks - great to send to friends who've left the area but still love the Market. I made these at home - not for sale at the Market. Already eaten. It's been a short week (yet long at the same time - how does that work?) so I'll be brief. The weather Saturday looks great. 69 degrees for a high with copious sunshine? That right there inspires me to feel OK about turning on the oven or the stove to make something delicious out of local corn, berries, scads of vegetables, fruit - how about something like the tartlets above? 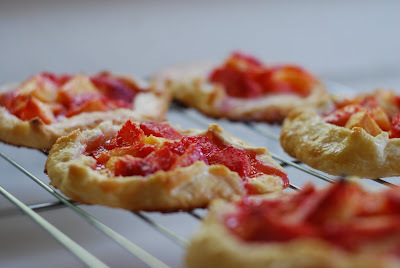 Those were made with Market nectarines, but it was on a hot day. I'd triple the recipe on a cooler day. YUM. OK. Variety. 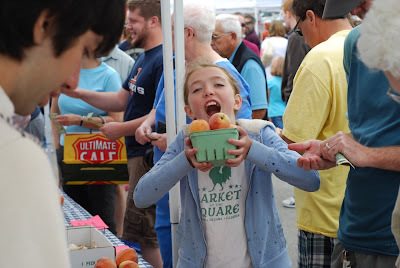 While the Market is an excellent place to shop and hang out all 28 weekends, peak season is extra-special. I'm not talking just about the variety in local produce, though that's impressive. Where else can you go to get the freshest produce in town, nationally-decorated goat cheese, farm-raised meat and honey, preserves, beautiful jewelry, accessories fashioned from repurposed wool sweaters, awesome woodcraft, hula hoops, vegetarian wraps, and homemade English muffins? Nowhere else. I'm really looking forward to this weekend's Market after being rained on the last two. Hope to see everyone -EVERYONE! - out there! Local growers have had a couple of particular issues this season - every season it's a different combination of Things Gone Awry - and those are WEATHER and VARMINTS. WEATHER: It's been tricky at best this season - a cool start, more rain that anyone really knows what to do with, no slow heat, etc, so that's delayed some things (sweet corn) and shortened the season of others (that last heat wave turned stawberries into goo). The weather has also been a factor on a couple of Market days, most notably that very windy Saturday in May and a very soggy 4th of July. It's important to remember that the produce vendors are out there every weekend, no matter the weather, selling that fresh and local produce. 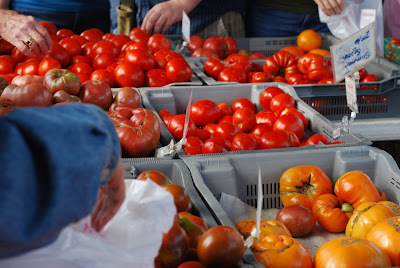 We all know that rain is going to be a potential factor this weekend, so break out the umbrellas and galoshes and get thee to the Market for some fresh food! I'll take a photo of you (with permission, of course) in your finery to post in the Market Flickr. The Market can be fun, even on the less-than-perfect days. Thanks to Kathy of the Urbana Free Library for the inspiration. VARMINTS: I received a phone call from Bob Kleiss of Kleiss Produce a couple of days ago, telling me that he would, indeed, have sweet corn, but it wouldn't be that much due to the raccoon problems he's been having. Jon at Blue Moon told me last weekend that varmints have been a major problem for them this year, with a second planting of tomatoes becoming critter food instead. Growers all over the area (and in other areas) have noticed an uptick in the number of voles, moles, mice, bunnies, raccoons, and other small furry mammals eating food that's meant for people. As it turns out, varmints don't really care who it's meant for. Raccoons partied in the one patch of sweet corn I grew years ago, and the aftermath was such that I swore I'd never do it again. By eating seasonally and supporting local growers by coming to the Market, consumers have to roll with the punches. When the cherry trees freeze or get eaten by deer, there are no cherries at the Market. When it gets really hot, it's hard to find salad mix. When varmints eat entire second plantings of tomatoes, variety might be a bit more limited. It's part of being in the community, of knowing your growers.... and you might end up trying something you never thought you'd try. 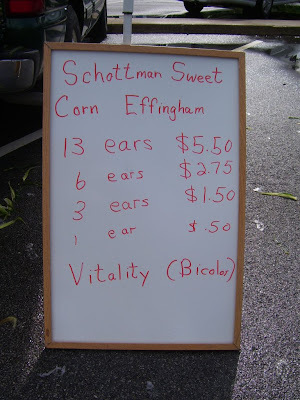 You can learn a lot at your farmers' market. Yes, I can confirm that most excellent Illinoisian delicacy - SWEET CORN - will make its presence felt, however shortly, this weekend. Look for it for sure in rows one and four, and come to the City tent to find out which, if any, other vendors have it available. It's highly recommended that you come early to avail yourself of the stuff, as it won't last long. There will be plenty more corn as the season progresses. It's also time for summer berries - there will be blackberries, raspberries, black raspberries, blueberries, and maybe a few gooseberries, so get your cobbler on this weekend. 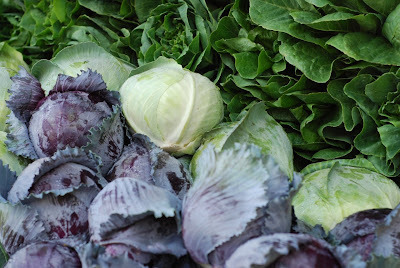 Other local produce: all kinds of greens, tomatoes, cucumbers, green beans, onions, leeks, potatoes, peaches and nectarines, broccoli, cabbage, chard, kales, and MUSHROOMS!, not to mention a wide variety of goat cheeses, farm-raised meat and poultry, fresh eggs, and honey. Of note: If you're into Stewart Pequignot's bagels or artisanal breads, stock up this weekend - he won't be back at the Market until 7/25. Art at the Market is back for its third installment of the season. Urbana's Public Arts Program is bringing in local artist Roberta Bennett to provide a watercolor workshop to the public - it's free and open to all ages, and goes from 8 AM - noon this Saturday! Look for AatM right next to the City tent at the NW entrance to the Market. Questions? Contact Anna here or call 384-2311. 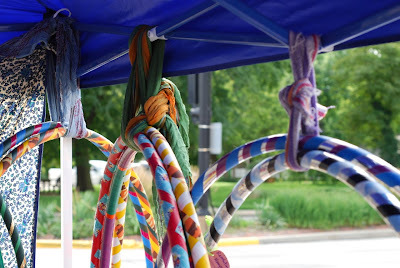 Second Saturday is happening in Downtown Urbana from 10 AM - 2 PM this weekend. This event is sponsored by the Urbana Business Association and showcases Downtown Urbana merchants and other vendors in a unique outdoor setting. Questions and other inquiries should be directed to Katie or Alix at the UBA - you can also reach them by phone at 344-3872. Have a great weekend - I'll see you at the Market. And if it's raining? I'm the one in orange galoshes. Nectarines came in last week, and holy MOLEY, are they something. 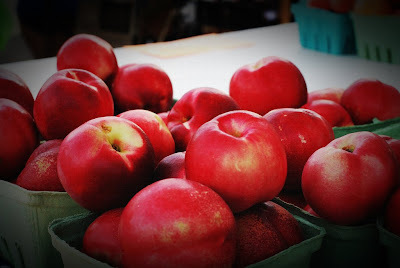 The ones pictured above come from Mileur Orchard in Murphysboro, IL. Anyway, this is the time of year we wait for - there's an incredible selection of produce and farm-raised foods available. Patrons spending money with Market growers ensures their survival and keeps money in the local community. So - now's the time to make that 4th of July picnic list, and Saturday's the time to come by the Market and pick up your list items. Have guests for the weekend? Roust them out of bed and show them how we do it here in Urbana - take them to buy some peaches from Sager Farms or blueberries from Cary's Garden of Eatin' or Moore Family Farm, run them past Prairie Fruits Farm's booth for some of their award-winning goat cheeses, convince them to try the first tomatoes of the season from Kleiss Produce (or some organic ones from Blue Moon Farm) - the possibilities are endless. Lisa and Angie will be out at the Market directing traffic and surveying the scene - please stop by the City of Urbana tent with questions, comments, ideas, whatever about the Market. We love feedback.